Ernest Thompson Willows was born in Cardiff, United Kingdom, on July 11, 1886, son of Joseph Thompson Willows, a local dentist. Ernest was on-track to follow in his father's footsteps into dentistry when, sometime after 1903 he became smitten with airships, probably upon reading newspaper accounts of the efforts of Alberto Santos-Dumont and of Captain William Beedle who was experimenting with airships in London at the time. (Willows admitted in 1911 that he had, indeed, been inspired by the exploits of Santos-Dumont!) Willows built his first airship at age 19, with his own design loosely based on Beedle's work. 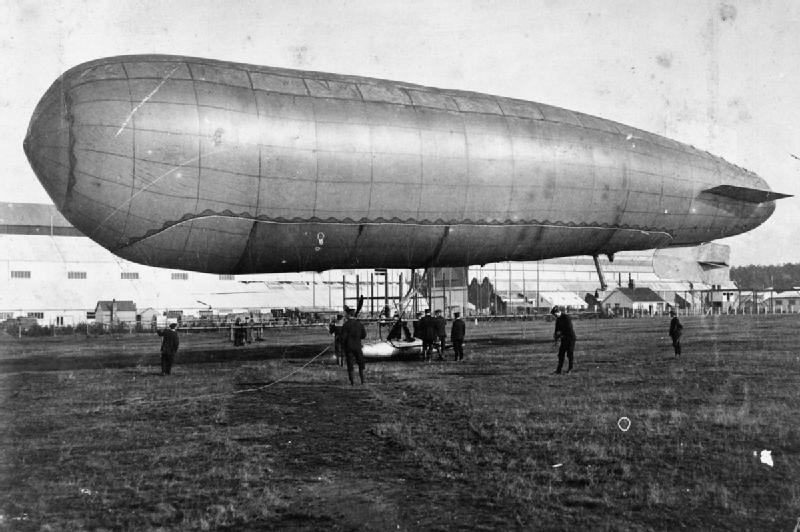 This first airship was the "Willows No. 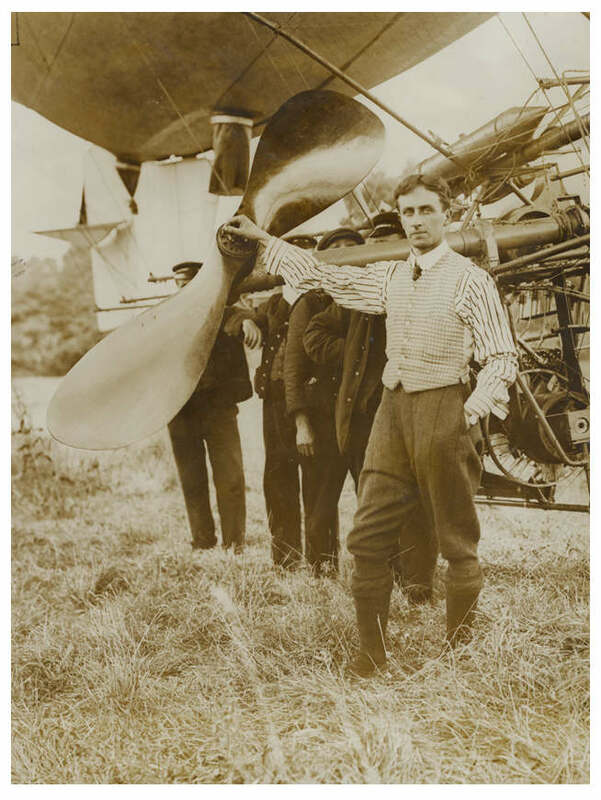 1" and he ascended on the first flight on Aug 5th, 1905, a flight which lasted more than an hour and is said to have been the first controlled flight in an airship in Britain! 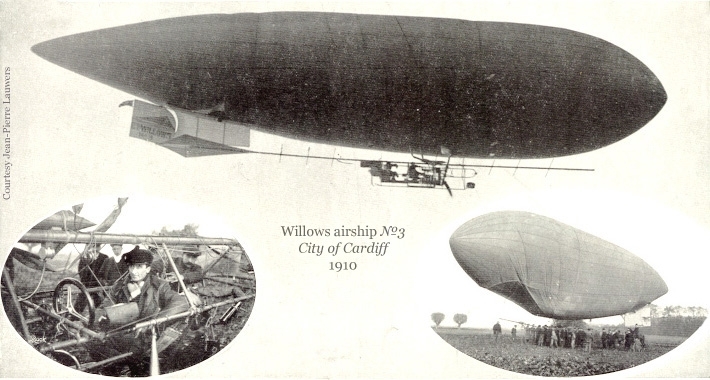 Between 1906 and 1908 Willows teamed with Beedle to make airship gondolas for the British Army when Beedle came to Cardiff. After that, Willows set out to design and build his No. 2 using his growing skills. Over the course of the next 21 years, Ernest Willows builds 4 more airships and gains much fame, but little fortune. Nevertheless, he is considered in aviation circles as the "Father of British Airships". Today, despite earning "Airship Pilot Certificate No. 4" from the Royal Aero Club of England, (the 1st certificate to a civilian), he is little known and there exists no stone monument to his accomplishments. There is a wonderful book about him, seen at right, "The Father of British Airships", by Alec McKinty, 1972. 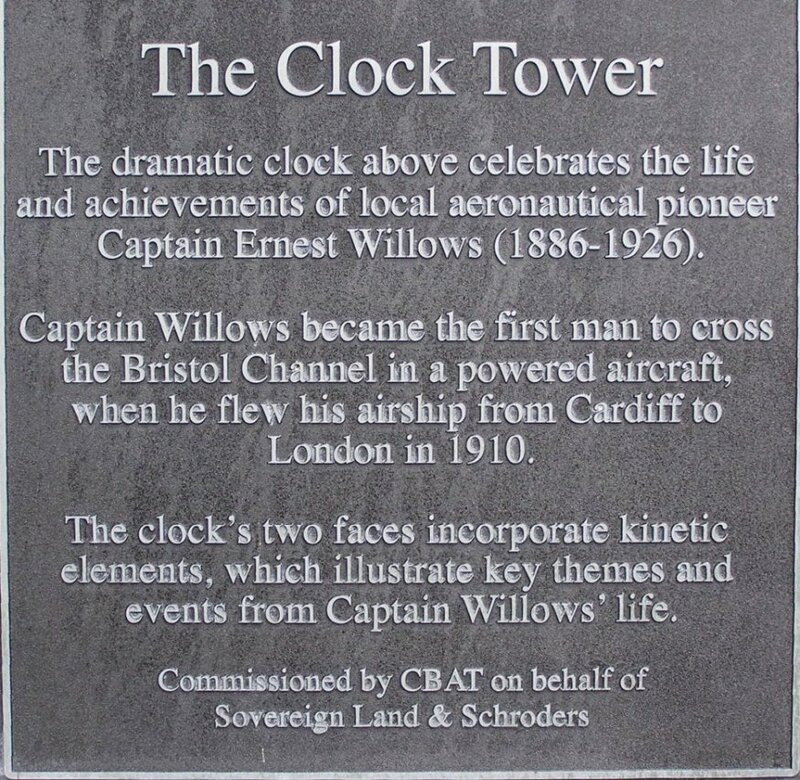 His home town of Cardiff, long changed since the days of airships, has a pub named after him, and a tower clock honoring him. 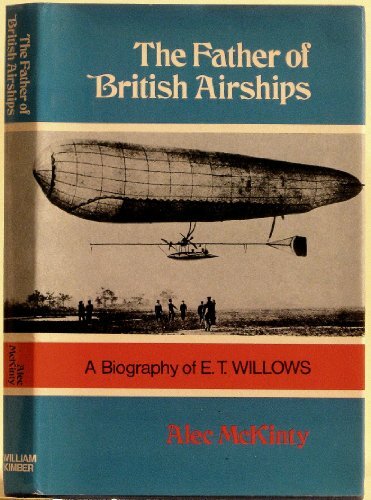 This page is about the Willows airships and recovering some interesting sites where Ernest Willows' airships were seen, but I will make note here of the sad end to Ernest Willows life. Some say Ernest Willows failed as a business man. But nothing could be further from the truth. As a very young man, he created his own Airship company, "Willows Aircraft Company Ltd", his factory in Cardiff, and during World War I he employed around 150 people making kite and barrage balloons for the British war effort. 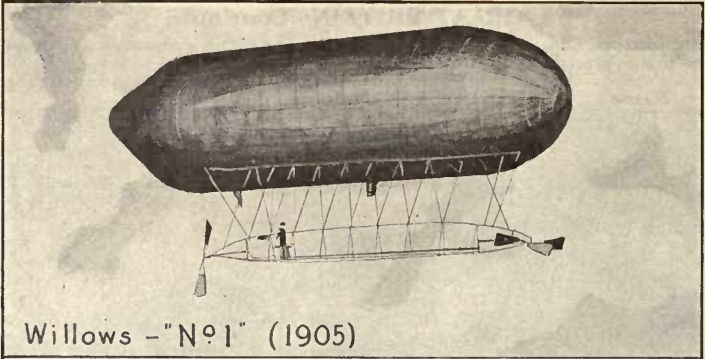 One of his airships, his No. 4, was purchased by the British Admiralty. Unfortunately, he failed to receive the recognition he deserved and after the war, was reduced to flying passenger-carrying balloons at fairs and events, nearly broke from his exploits in airship production. He died at age 40 when, on Aug 23, 1926 at Hoo Park in Bedford, the envelope of his passenger balloon ripped from its netting and he and his passengers fell to their deaths. During the course of this investigation I found many exciting locations, detailed below, but first, I think it is appropriate to describe how the 5 Willows airships can be distinguished from each other. 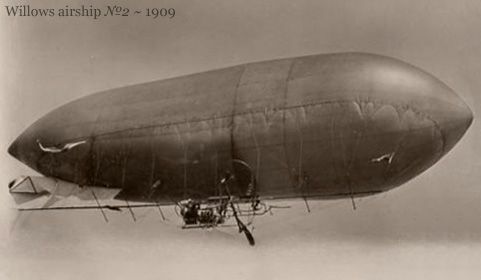 Like so many of the early airships, they are often confused with other airships and with each other in period photographs. 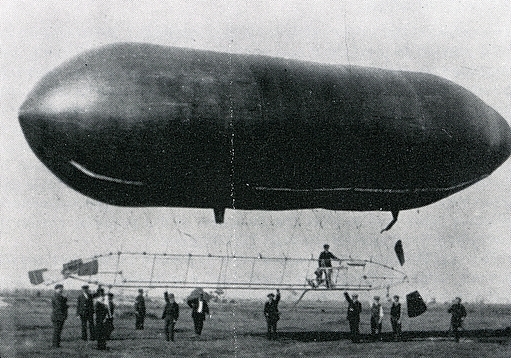 Built in 1905, Willows' first airship at age 19, offered some very unique features amongst airships of the day. Most notable is that it flew and was navigable! In addition to a 10 foot diameter, pusher propeller, the engine drove a pair of propellers in the front. These tractor propellers could be swiveled to direct their thrust and thus the ship could turn, ascend or descend without the use of rudders or elevators. The gas envelope of the No. 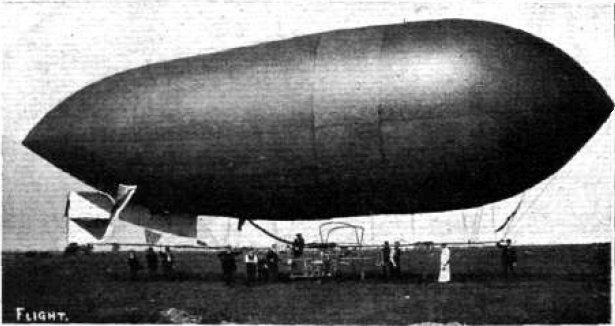 1 was 72 feet long, 18 feet in diameter, made of varnished silk (common among the early, small airships of the era), carrying a 30 foot long, triangular, steel-tube frame gondola. Unlike the Knabenshue No. 1, flown the same year, the Ernest Willows did not have to scramble precariously forward and aft on the framework gondola to ascend and descend. The Willows No. 1 had a pair of articulating propellers at the bow, driven by the same engine driving the pusher propeller, which Willows could direct to provide thrust at the bow end to turn, climb and descend. Willows could control the airship while remaining near the engine controlling the forward propellers with levers. An article in the Dec 3, 1910 Scientific American Supplement says Willows made 6 flights in the No. 1, and then embarked on the design and construction of the No. 2. Photo credit: Jane's "Pocketbook of Airships", 1976, pg 90. Note that though the first photo above shows two people on the No. 1 frame, the first photo is of the "original" No. 1, and to prevent the center of the inflated gas envelope from sagging in the middle (as can be seen in the photo), very soon Willows extended the gondola framework to 45 feet. Examine the 1st and 3rd photos and you can see this change. The modified No. 1 is sometimes called the "No. 1a". The No. 1 (and 1a) was designed to fly "heavy", meaning even with the lifting hydrogen the entire vehicle remained about 40 pounds heavy and would stay on the ground. The airship would be lifted by a ground crew, and thrust would propel the craft into the sky while the forward propellers, tilted up would lift the stern and the ship could ascend under power. Visual: Open frame, 33 foot steel-tube gondola, pusher prop, dual, articulating propellers at forward end. No horizontal or vertical fins on envelope or gondola. No rudder. Willows flew the No. 1 only six times according to the available record. There may be numerous reasons for this, but quite possibly he was either dissatisfied with the performance of the No. 1 or he already had bigger and better ideas. Whatever the reason, he debuted the Willows No. 2 in November, 1909. The No. 2 was larger than the No.1 and displayed many innovative changes. Photo credit: "Flight" magazine, July 2, 1910, pg 509, Public domain. Visible innovations include a single tube keel, 58 feet in length, made rigid with cross-bracing and wire; a larger tubular open frame single-seat gondola slung centrally on the keel; twin, tilting propellers now located on the gondola near the engine; no pusher prop, and a new vertical fin and cruciform rudder. Steering the No. 2 was by the new rudder, while ascent and decent were affected by the tilting twin propellers. Visual: Vertical fin and rudder, keel, larger centralized open-frame, single-seat gondola. From November 1909 to February 1910 twin propellers, formed by steel tubes with aluminum blades only covering the outer third of the propeller diameter. From (approx) March 1910 and later, solid "Handley Page" built propellers. Visual: Single-tube boom keel, rudder and vertical fin; fixed, kite-shaped horizontal stabilizer; larger centralized open-frame, two-seat gondola. Twin, Handley Page propellers. The Willows No. 2 was short lived. Though Ernest demonstrated the No. 2 publicly, and several photos of it exist, by the end of October 1910, he had removed the No. 2 from service and rebuilt it. Turns out Willows was seeking something he could do to "put his name on the map", and he decided a Channel crossing non-stop to Paris would do it. That would be a note-worthy achievement, as yet never-before-done. But to cross the Channel he'd need a larger airship. The "new" incarnation of the No 2, became the No. 3 and then soon after that was renamed "City of Cardiff". 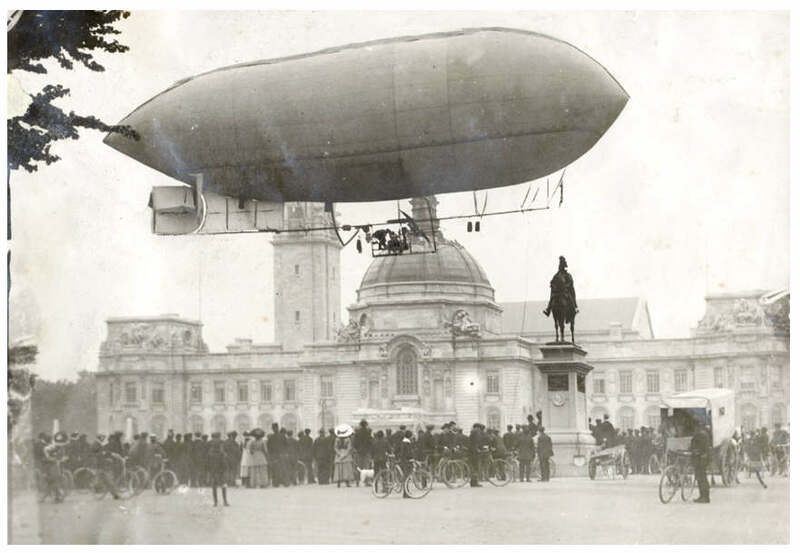 The City of Cardiff was used to cross the English Channel on November 4, 1910, Ernest Willows becoming the first Brit to cross the Channel by airship. Photo credit: 1911 post card, Public domain. Photo credit: Extracted from a 1910 era postcard, Rosebud's Early Aviation Archive, http://www.earlyaeroplanes.com/, Public domain, corrected for distortion. The No. 3, City of Cardiff, is difficult to distinguish from the No. 2, but the most obvious discriminator are the visible differences in the longer-looking tail of the envelope (because the No. 3 envelope was a larger design than the No. 2 envelope), and the addition of a horizontal stabilizer to the keel, and in clear photos, the words "E.T. Willows No. 3" printed on the side of the rudder. The keel boom of the No. 3 is also 10-14 ft longer than the No. 2's keel, but this is terribly hard to discern in photos. Visual: Unknown. No photo of this modification has been identified. Note on these dimensions for the No. 2 and No. 3: The available publications provide specs for the No. 2 and No. 3 that are all over the place. The length and diameter of the No. 2 & No. 3 is reported as (No. 2): 80 ft x 22 ft, 83 ft x 22 ft, 86 ft x 22 ft, 82 ft x 22 ft, 82 ft x 20 ft; (No. 3): 110 ft x 26 ft, 120 ft x 40 ft. This posed a dilemma on just what measures to post in this article, so I solved the problem by identifying something in the frame gondola the dimensions of which I was satisfied I could estimate, and making repeated measures from the available photos and taking the average measurements. This method, I suspect, produces a length slightly shortened from the design length due to a "drawing-in" of the envelope fore and aft as it is inflated, while the diameter is somewhat constrained by the permitted diameter of the circumferential ropes or cables around the envelope. I estimated that the maximum cross-section diameter became somewhat oblate or oval when inflated, with the vertical diameter about 1.12 times longer than the horizontal diameter so I compensated for this in my measurements. Photo credit: 1910 post card, Jean-Pierre Lauwers collection,Public domain. Photo credit: "Flight" magazine, Nov 12, 1910, pg 935, Public domain. Just how, in 1910-1911, the photo ended up "stretched" I am at a loss to explain. And as a final note on the No. 3, I found no photos showing its configuration with a 120 ft x 40 ft envelope reported in several articles as the "eventual" or "ultimate" size of the airship. The distinctive length to diameter ratio of 3.0 for these dimensions would be clearly visible. The No. 4 has an interesting though sketchy history. Willows built the No. 4 at his new shop in Birmingham and in early 1912, sold it to the British Admiralty despite a military inspector's report that the airship had value only for training and no other practical value to the army or the navy! Nevertheless, the WIllows No. 4 was commissioned "His Majesty's Naval Airship No. 2" in September 1912. The "Willows No. 4 (Note it is misidentified as 'The Baby')"
This photo shows the Willows No. 4 (HMNA No 2.) in its initial configuration with a triangular vertical stabilizer on the stern of the keel, and a dark-colored rudder of the typical Willows design. Publications of the day often misidentified the Willows No. 4 as the 'Baby'. 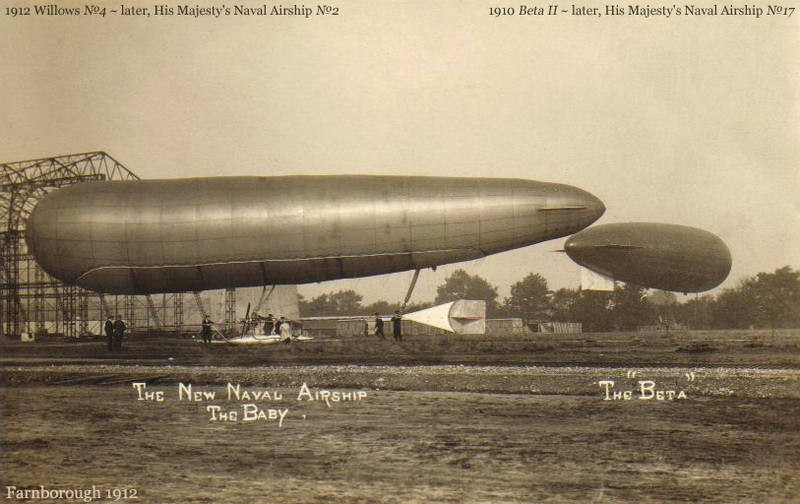 We know it is misidentified because also seen in the photo is the Beta, which was modified in 1910 and had used and enlarged the envelope from the "Baby"! So when this photo was made the "Baby" no longer existed! For reasons unknown, the Admiralty felt the HMNA No.2 was inadequate and needed modifications. The fin and rudder on the keel were removed and fitted to the stern of the envelope, then envelope was enlarged to 62% more volume some time in 1913. The HMNA No. 2 was then only used sporadically in training till Jun 1914. Some time after June, the Willows two-seater gondola was replaced with a three-seat gondola. 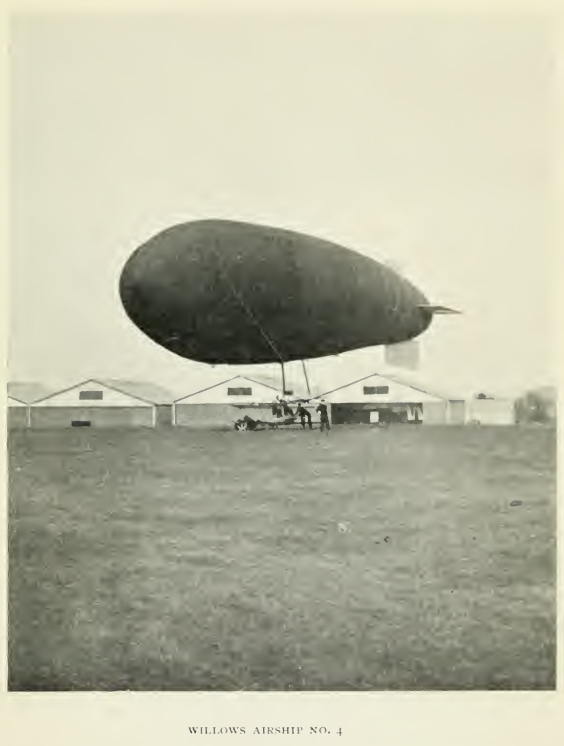 Still for reasons unknown, the vehicle remained unsatisfactory and she saw only one test flight with the 3-seat gondola and then she sat deflated sometime at Farnborough till the beginning of WW I. Visual: Closed, 2-seat gondola; dual, 4-blade, swiveling propellers at either side of the gondola. Triangular vertical fin at stern of keel, cruciform rudder attached to fin. Visual: Closed, 2-seat gondola; dual, swiveling propellers at either side of the gondola. Fins and rudder now mounted on the stern of the envelope, removed from the keel. Visual: Modified envelope 62% more volume and new 3-seat gondola. 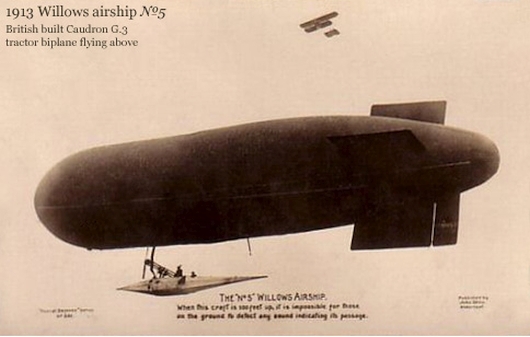 Postscript: At the outbreak of WW I, suddenly there was a "need" for airships for patrol and submarine spotting. In early March, 1915, the deflated envelope of the Willows No. 4, actually the HMNA No. 2 as it no longer resembled the Willows design, was sent to Kingsnorth where it was used in the prototype of the Submarine Scout (S.S.) airship fleet. 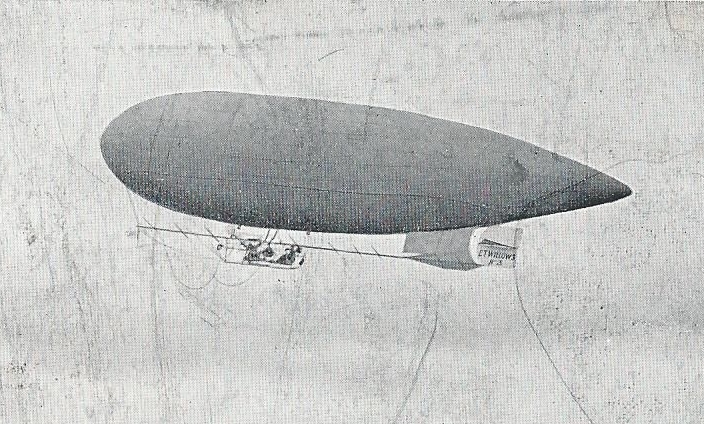 The envelope was reduced in volume since the scout class airship would carry only a crew of two. On March 18, 1915, the remnant of the Willows No. 4 was christened as the S.S. 1. 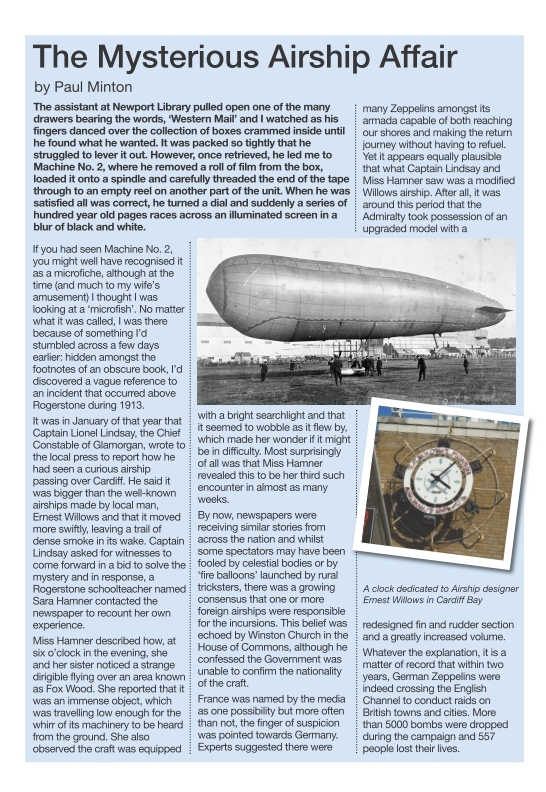 There is a possible connection of the Willow's No.4 to sightings of a mysterious airship in the UK in January 1913. In January that year, sighting were reported of a "curious airship" in the area of Rogerstone and Cardiff. The No. 4, having caught the eye of the Admiralty, had been purchased to be deployed by the Navy at Farnborough in the late Summer of 1912. Farnborough is about 105 miles east of Cardiff/Rogerstone. It's entirely conceivable that Navy modified Willows No. 4, now called His Majesty's Naval Airship No. 2, in clandestine flights from Farnborough to Cardiff - Willows' old home-base - was seen by locals! Fresh from the sale of his No. 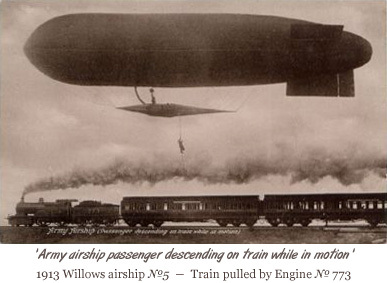 4 to the Admiralty, Ernest Willows embarked on his next airship, his grandest and last. 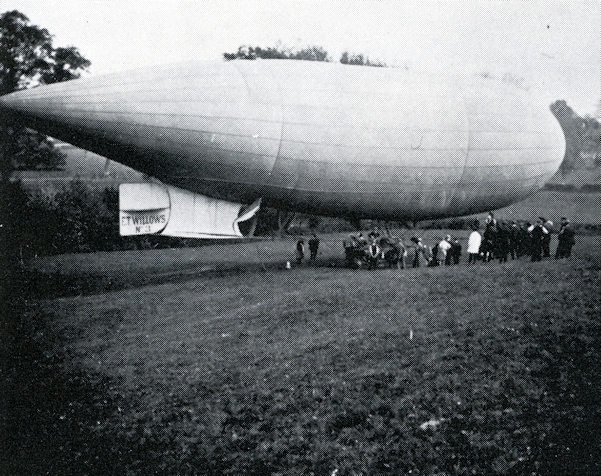 He set up a balloon school at Hendon and throughout 1913, designed and built the No. 5. She made her first flight November 27, 1913. Visible innovations: Much larger envelope, 50,000 cu ft, new material - rubberized fabric - similar to that used in other British airships of the period. Long, tapered 4-seat gondola, large fins and rudder mounted on the stern of the envelope. Willows retained his unique dual tilting propellers on either side of the gondola. Operating dates: ~Nov 1913 to ~1915? Visual: Rudder, vertical fin and horizontal stabilizers on rear of envelope, no keel, larger centralized 4-seat enclosed streamlined gondola, twin tilting propellers. I found no record of the disposition of this, the last Willows airship, but WW I broke out barely 6 months after the Willows No. 5 entered service, and Ernest Willows joined the war effort and produced barrage balloons in his factory at Cardiff. On June 4, 1910 Ernest Willows landed the No. 2 near the Lord Tredegar statue, on the grounds of Cardiff City Hall and then flew back to his shed at East Moors. It was a "big" event and well-covered by the press. Note: Today we'd say this photo was "photoshopped", but in this case, the photographer only attempted to make visible the top edge of the airship's gas bag which, given the conditions, blended into the sky. 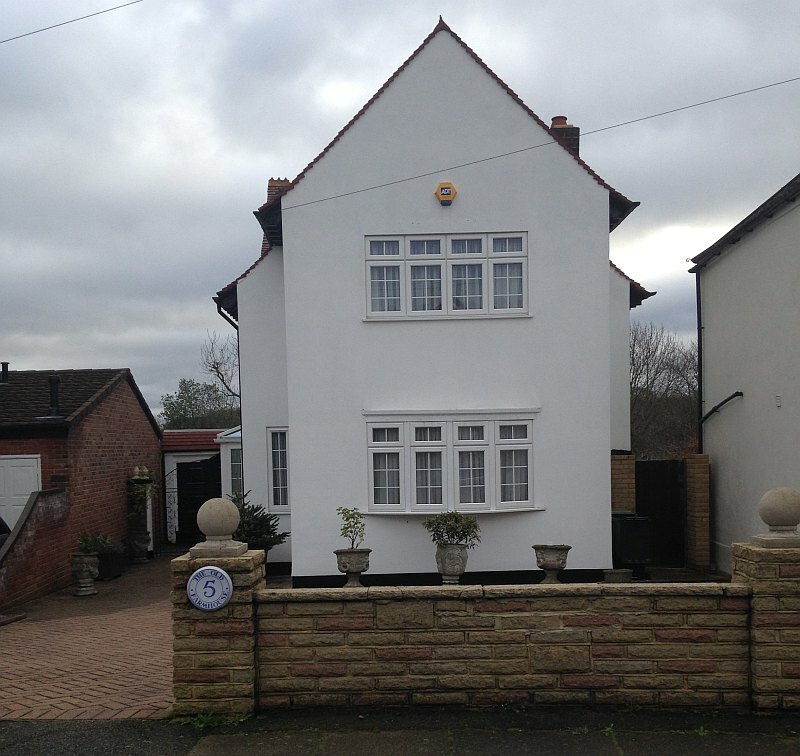 At the time of this photo, such alterations were done by hand - very carefully - this one, not so well! 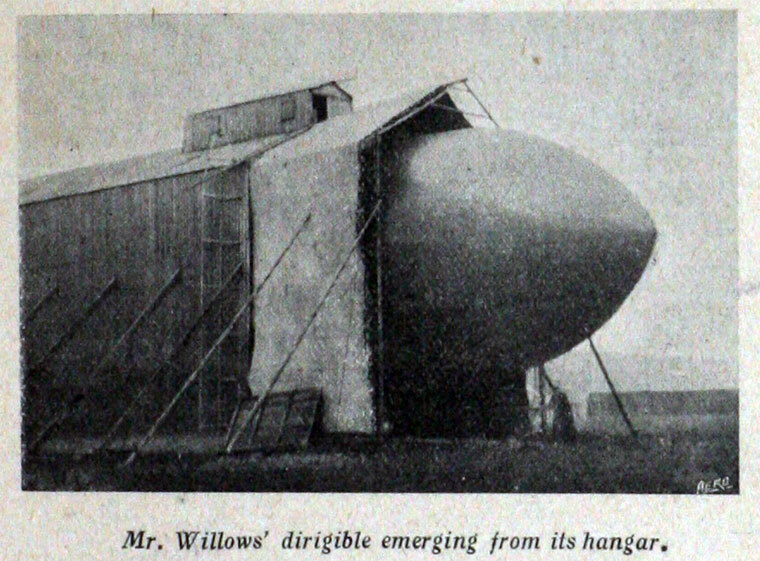 Willows built his first three airships at the facility (shed) he built at East Moors. I was unable to find a photo of the shed, but I found an article which says the present-day "Willows High School" is located on the land "near where the shed once stood". This land is also the former RAF Pengam Moors air field. The first photo of the No. 2 (above), was taken at this field, presumably near the shed. In August, 1910, Willows set out to display and fly his airship at an exhibition at the Chrystal Palace a distance of 135 miles from Cardiff. He began the journey as the sun was setting on Saturday night, the 6th, heading east-southeast, intending to follow a beacon light from a lead-car driven by his father. Soon the beacon light failed and Willows was forced to navigate by city lights, stars, and occasionally descending to shout at people below by megaphone asking for his whereabouts. Nearing the Chrystal Palace, Willows tossed out his grappling hook, but the rope broke when the hook snagged a tree! He continued eastward, as it was not safe to attempt to land without the grappling hook and to make matters worse, he ran out of fuel. Willows stayed afloat until dawn, August 7th, when, while over Lee, he secured the attention of a homeowner or watchman who then enlisted help and the impromptu ground crew were able to grab the guide-rope and bring the craft down. The spot at which the Willows II airship landed was the Woodman Farm in Lee between Grove Park, Horn Park, and Mottingham. Willows spent Sunday securing some fuel and arranging to have some hydrogen delivered to continue his flight. 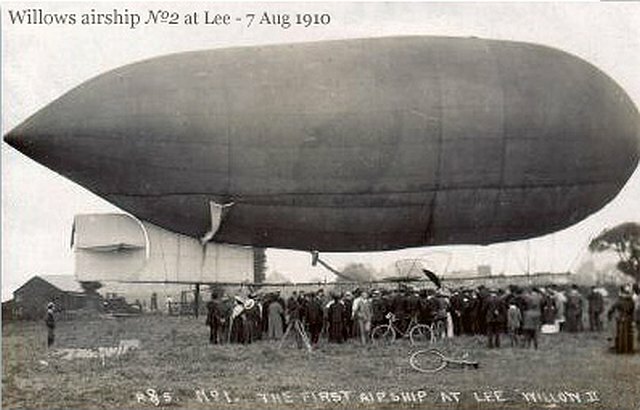 On Sunday, August 7th, the Willows II airship was photographed and the photograph made its way to postcard fame since the Willows was the "1st airship to land at Lee". The treat is that not long after the events of August, 1910 which brought the Willows II airship down onto the Woodman Farm, the Woodman Farm became the "Melrose Farm" and a farmhouse was build on the property which survives into today! We can't know the exact spot where the Willows II landed on the farm property, but to be able to stand on Ashdale Road (refer to the map above), next to this magnificent old farmhouse and know that in Aug 1910, the sky over this very spot held the Willows airship - a sight no one will ever again experience, well, it's the next-best thing to standing on the spot! On November 4, 1910 Willows flew the No. 3, "City of Cardiff" from Wormwood Scrubs to France. Again, the precise location where the No. 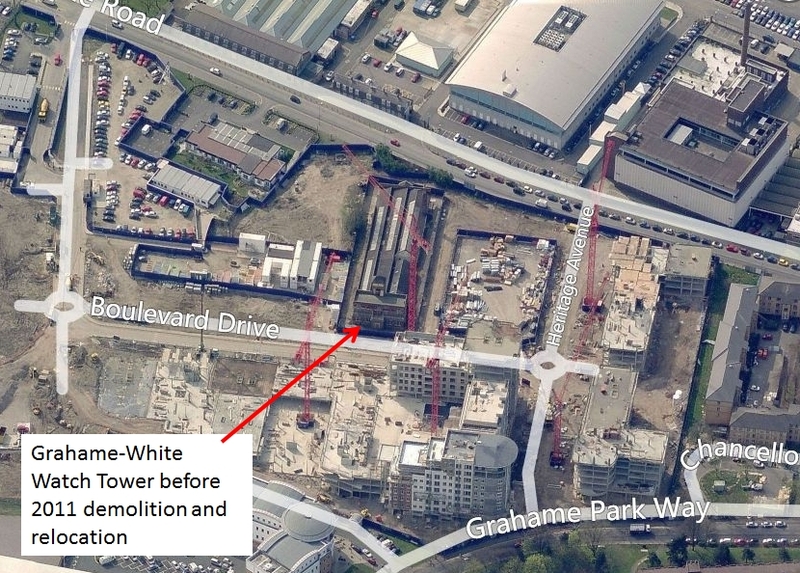 3 was hangared defied my research efforts, but the general area of the aerial activity at Wormwood Scrubs was identified as it is said to have been at the present-day location of the Linford Christie Stadium. Photo credits: Jane's "Pocketbook of Airships", 1976, pg 91. In 1913, Willows set up his balloon school in Hendon. 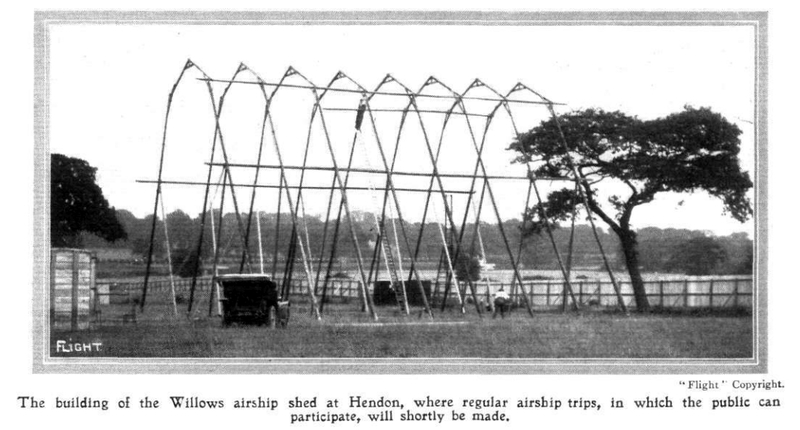 Several aviation magazines of the era when writing about the flying activity at Hendon mention the airship shed of Willows. I have not found just where his shed would have been at Hendon, but there is this photo of a Willows shed under construction. I have no way of knowing if this shed was the location of the No. 5, but if it was, I can only assume that this shed was extended because the framework in this image measures only about 45 ft tall, and 68 ft long. The No. 5 was 130 feet long. In the Google maps window below, the marker is on the precise spot where the Grahame-White watch tower was located, (Lat Lon) 51.595710 -000.241532. 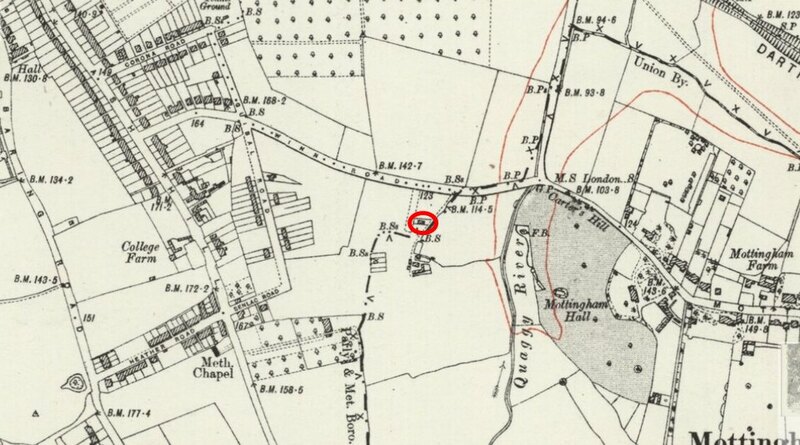 In relation to this known spot, it is not known where the Willows airship shed was, but in 1913, given that this was an airfield, it likely would have been visible from the Grahame-White watch tower. There is a commemorative clock dedicated to Ernest Willows in his home town of Cardiff, Wales, located at Tacoma Square in Cardiff Bay. It was designed by Andrew Hazell in 2000. The two clocks represent Cardiff and London, remembering the flight Willows made between the two cities in August, 1910. 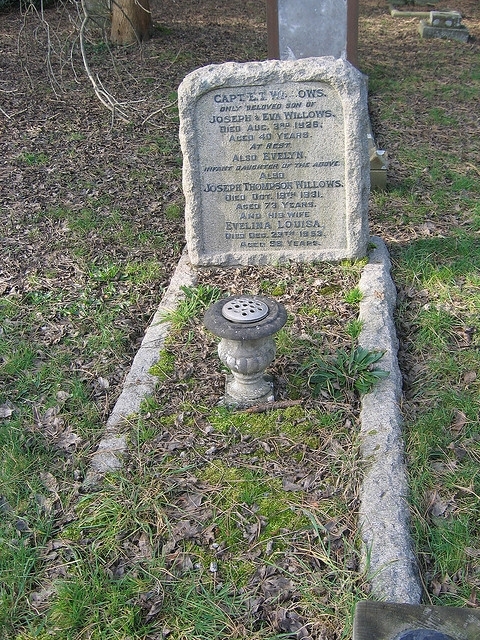 Ernest Willows is buried in Cardiff, at the Cathays Cemetery.